BORNOIU, I.-V. , GRIGORE, O. This paper presents a method for identifying human stress levels by using a Kohonen neural network. The study focuses on differentiating between a relaxed and a stressed state and it presents a series of parameters (skin conductance response signal power, skin conductance response signal frequency, skin conductance level gradient, response rise time and response amplitude) extracted only from the electrodermal activity signal. A very strict recording protocol was used to minimize the artifacts caused by the bad connection between electrodes and skin. A stress inducing method is presented that can be used to replicate results in laboratory conditions. G. Rigas, C. Katsis, P. Bougia and D. Fotiadis, "A Reasoning-Based Framework for Car Drivers Stress Prediction", in Proc. of 16th Mediterranean Conference on Control and Automation, Ajaccio, Corsica, France, pp. 627 - 632, Jun. 2008. J. A. Healey, R. W. Picard, "Detecting Stress during Real-World Driving Tasks Using Physiological Sensors", in IEEE Transactions on Intelligent Transportation Systems, vol. 6, issue 2, pp. 156-166, Jun. 2005. J. Zhai, A. Barreto, "Stress Detection in Computer Users through Non-Invasive Monitoring of Physiological Signals", in Biomedical Sciences Instrumentation, vol. 42, pp. 495-500, 2006. A. Drachen, L. E. Nacke, G. Yannakakis, A. L. Pedersen, "Correlation between Heart-Rate, Electrodermal Activity and Player Experience in First-Person Shooter Games", in Proc. of the 5th ACM SIGGRAPH, ACM SIGGRAPH Publishers, pp. 49-54, 2009. 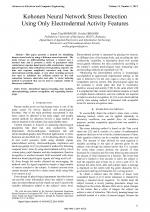 D. Kulic, E. A. Croft, "Affective State Estimation for Human-Robot Interaction", in IEEE Transactions on Robotics, vol. 23, issue 5, pp. 991-1000, Oct. 2007. G. Rigas, C. D. Katsis, G Ganiatsas, D.I. Fotiadis, " A User Independent, Biosignal Based, Emotion Recognition Method", in Proc. of the 11th International Conference, Corfu, Greece, pp. 314-318, 2007. B. Wolfram, Electrodermal Activity, Springer US, 2nd ed., 2012. M. E. Dawson, A. M. Schell, D. Filion, "The Electrodermal System", in Handbook of Psychophysiology 3rd ed., New York: Cambridge University Press, 2007. S. Schmidt, R. Schnider, M. Binder, D. Burkele, H. Walach, "Investigating Methodological Issues in EDA-DMILS: Results from a Pilot Study", Journal of Parapsychology, vol. 65, pp. 59-82, 2001. R. Henriques, A. Paiva, C. Antunes, "On the Need of New Methods to Mine Electrodermal Activity in Emotion-Centered Studies", in 8th International Workshop, ADMI 2012, Valencia, Spain, pp. 203-215, Jun. 2012. R. Henriques, A. Paiva, C. Antunes, "Accessing Emotion Patterns from Affective Interactions Using Electrodermal Activity", in 2013 Humaine Association Conference on Affective Computing and Intelligent Interaction (ACII), Geneva, pp. 43-48, Sept. 2013. C. Kirschbaum, K. M. Pirke, D. Hellhammer, "The 'Trier Social Stress Test' - A Tool for Investigating Psychobiological Stress Responses in a Laboratory Setting", in Neuropsychobiology, no. 28, pp. 76-81, 1993. M. V. Thoma, R. La Marca, R. Bronnimann, L. Finkel, U. Ehlert, U.M. Nater, "The Effect of Music on the Human Stress Response", in PLoS ONE, vol. 8, 2013. S. Schmidt, H. Walach, "Electrodermal Activity (EDA) - State-of-the-Art Measurement and Techniques for Parapsychological Purposes", in Journal of Parapsychology, vol. 64, pp. 139-163, 2000. I. V. Bornoiu, O. Grigore, "A Study about Feature Extraction for Stress Detection", 2013 8th International Symposium in Advanced Topics in Electrical Engineering (ATEE), Bucharest, Romania, May 2013. K. Kim, S.W. Bang, S.R. Kim, "Emotion Recognition System Using Short-Term Monitoring of Physiological Signals", in Medical and Biological Engineering and Computing 2004, vol. 42, pp. 419-427, 2004. T. Cover, P. Hart, "Nearest neighbor pattern classification", in IEEE Transactions on Information Theory, vol. 13, issue 1, pp. 21-27, January 1967. T. Kohonen, "The Self-Organizing Map", Proceedings IEEE, vol. 78, no. 9, pp. 1464-1479, Sept. 1990. T. Kohonen, Self-Organizing Maps, Springer-Verlag, Berlin, 1995. S. Haykin, Neural Networks. A comprehensive foundation, Second Edition, Prentice Hall, 1999. R. Rojas, Neural Networks. A systematic introduction, Berlin, 1996. M. Su, T. Liu, H. Chang, "Improving the Self-Organizing Feature Map Algorithm Using an Efficient Initialization Scheme", in Tamkang Journal of Science and Engineering, vol.5, no.1, pp. 35-48, 2002. I. T. Jolliffe, Principal Component Analysis, Springer Series in Statistics, 2nd ed., Springer, NY, 2002. Citations for references updated on 2019-04-22 08:04 in 95 seconds.